Poetics: What’s in a Name? Good evening, it’s Amaya Engleking here tending bar and I want to know before we sit around all night guzzling Oktoberfest lager and waxing poetic about leaves, tell me: What’s your name? I’m in the season of life in which I have several lists of potential baby names and have spent countless sleepless nights trying to come up with the most melodic and meaningful pair of names to name an unborn child. I know I’m not alone when I say we protectors of the next generation put a lot of care and consideration into the task of naming someone, even a pet! We hope that our progeny (or precious creatures) will live up to their names, or perhaps even more accurately, the essences of the names will define their characters. In China, many families will even consult experts on Taoist cosmology and the classic, I Ching, to assure their babies are named according to their destinies. My own first name carries various origins and meanings from around the globe. Am I living up to my destiny? I like to have a good cry under the stars every so often, does that count? And then there’s Margaret Walker with the most perfect surname for us contemplatives. Traveller take heed for journeys undertaken in the dark of the year. Go in the bright blaze of Autumn’s equinox. So tonight let’s write poetry about the meaning of our names. Look at your given name, a chosen alias, a middle name, family name, or maiden name and write an open-form poem of any length about it’s meaning. You don’t have to say what the name is but you’re free to do so in a subscript. I want to see more of an imaginative poem about the warrior (if you are a Walter or most males:) the one who walks (if you are Margaret Walker) or in my poem, say, the apocalypse. Just have fun with this and look up multiple origins to maybe learn something new about yourself. Hey you! What’s your name and what can I get for you? My name is Bearwarrior of honor and light, can I have a glass of water please… (yes one of my name means warrior too). Are you sure you don’t want to satisfy the bear in you with some good aged mead right about now? Sure, coming right up. 🙂 I thought the name would be ferocious enough to need some cooling. I don’t know about everyone else, but I feel kind of a rush right now when the doors open, so to speak. Maybe it’s because I just finished my poem for this prompt, like, seconds before we opened up, and also kids are napping:) I’m going to celebrate with chocolate cake and your poems. Cake’s on the bar if anyone wants to indulge. Good evening from the UK. 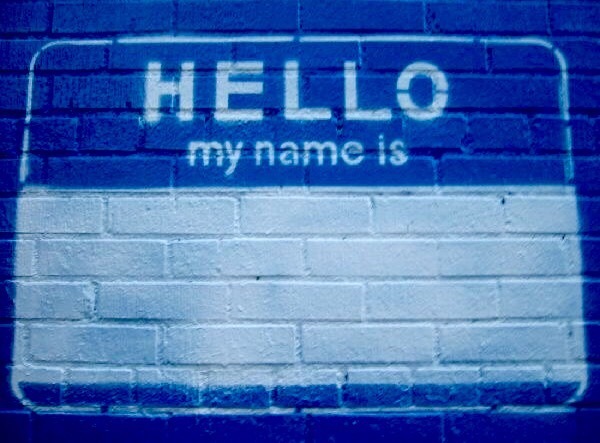 I’ve had my name for such a long time I can’t imagine having any other, although when I was much younger, I dreamed of choosing a different name. I quite like being called Nanny by my grandson, though! 🙂 I’m looking forward to reading what everyone comes up with for this excellent prompt. Thank you for hosting Amaya. We just celebrated our Canadian Thanksgiving over the long weekend, so filled with gratitude and so much food, right now. Thanks for hosting Amaya and looking forward to knowing more of you all! Happy Thanksgiving, Grace (and Dwight and Mish and all our Canadian friends!) Thanks for being with us post-feast. Hi, Chris Black calling from Wexford Ireland Christopher was the patron saint of motorists until he was demoted I also was christened The Poet’s Poet. I’ll have a pint of your best lager thank you. Chris! Good to have you here and since we know you won’t be designated driver, here’s our finest Bavarian Märzen – malty and spicy. Hi, I’m V.J. – yep, that’s it. Poem explains it all. It’s hot here today in Ontario – could use a cold lemonade. Yes, I see now. Well, initials can be easy to remember. Especially for that adorable little grandbaby! It’s funny cause I just researched the meaning of my name earlier. I have 3 first name but the one I use often is Hafsa, which means young lioness. Well cheers to some fortuitous synchronicity in the house! Had to give this one some thought…think I finally got it covered. Hi, I’m Glenn.. There is quite a tale about how I ended up with that name (which is what I wrote about). My names are all from the British Isles, but it turns out I am actually Italian/Greek. Thanks for hosting. I’ll have a diet Coke, please. ,And a piece of that chocolate cake. Hello, my name is Michelle, known in the pub as “Mish”. There is only ever been one person that called me “Mish” outside of online poetry and blogging, and that was my ex father-in-law. I always liked it. In 1st grade, our teacher was overwhelmed by the fact that there were 4 Michelles in the class, so I became “Shelley” through elementary school. The children I work with call me “Chelle”, being that most of them are barely two. I’ll have a lemonade, lots of ice. Our room was 80 degrees today, 98 with the humidex outside. Hi, Amaya. I loved this prompt. And I LOVE all the things your name can mean. How wonderful. Mine is slightly less interesting, but I have always embraced the “preposition” of it all. I can’t wait to come back (work writing deadline right now, but shall return) and read about everybody’s names. What a fun prompt. PS: I’d love a giant slice of that cyber chocolate cake. I’m off sugar again. Dammit. hi Amaya, your name has some lovely meanings in those different tongues. what a fabulous prompt to write and read on! giving my name a thought before I write. I entered the wrong title on the first try. Please delete the first one. Sorry about that! No problem and happy thanksgiving! I am the fair-haired spear-wielding son of he who is beloved of Jehovah. Oh, and also, I’m the fourth of this name, to minimize confusion. I’m sure someone, somewhere is named for those things. Glad you made it, Barry. I had never heard it before, a beautiful feminine name. It just felt like me, and made me smile, so it has been in my heart ever since. In retrospect I think it was a grace to have a found name. It softened my slef -loating to some degree. I then later came across “Lona Hessel” a fictional character in one of Ibsen’s lesser known but very wonderful (and actually hilarious) play called “Pillars of Society.” She was a strong independent witty voice who spoke truth to power and is one of the few Ibsen main female characters who would not be either oppressed or terrifying. This play actually was an Ibsen play that did not end in a suicide of some sort. I loved her, and the bond to this name grew. Yesterday in researching for this prompt I realized I had never actually looked up the meaning of this prompt. In English, Lona means “Solitary.” This fits, and the truth in it and the ability to love and understand myself even when so much of my little corner of the world cannot do so binds me close to this name I have taken. Thank you Amaya. A lovely prompt, and an important one for me. I will just sit over in this corner, in solitude, not loneliness, with a nice big glass of that glow I get from the dVerse crowd. Won’t be able to be on the poetry trail much until my road trip this weekend, but I am looking forward to it. “When something is important to you, you care what it is called. Thank You, Lona. Yay, so happy you made it this week, Lona. This story behind your name, how it sought you out like a gift from the most high, warms my heart. I once knew an Alona from Israel but I too, before you, had never heard your name before. I’m so glad to now know you:) And I have to tell you I searched for your end quote because it is so wonderful and reminds me of an earlier poem of mine, “Ragdoll.” But now I see as Google brought me to the one and only Lona Gynt that you were quoting your own poem. Off to read now. Stay seated, I’ll come to you. You are ‘free’ to drink as you wish. We learned the meaning of your name by Mr. Hubeny’s poem. I told him both my mother’s grandfathers had your name. He wasn’t surprised saying it used to be so common. One hardly ever hears that name in kids anymore. Cheers! I am late to to the pub and late to publish. Other commitments keep me from devoting more time to writing, but this prompt was easy for me. I will eventually read everyone’s poem and respond, even if it takes me till Sunday! Sometimes it takes me a week to catch up on reading. Glad you made it before last call! YOUR NAME IS YOUR HANDLE. SOME HAVE MORE THAN ONE NAME, DEPENDING ON WHAT THEY ARE DOING AT THE TIME!